Hope everyone is ready for a fabulous Halloween! There will be lots of trick-or-treaters out there, so watch for the little ones as your traveling about in the dark. This is also the most dangerous time of year using wicked candles. Scentsy Wickless Candles offers a safe alternative for you and your family to enjoy home fragrance. With our Scentsy Warmers and Scentsy Diffusers, you have over 100 different fragrances to enliven the senses and inspire the soul. It’s fun to be scared on Halloween, but you never want to risk your child’s safety. Parents can help reduce the risk of injury by following some simple tips from kids.org. Visit their website for more Halloween safety tips. Cross the street at corners, using tra c signals and crosswalks. • Children under the age of 12 should not be alone at night without adult supervision. If kids are mature enough to be out without supervision, remind them to stick to familiar areas that are well lit and trick- or-treat in groups. • Slow down and be especially alert in residential neighborhoods. Children are excited on Halloween and may move in unpredictable ways.• Take extra time to look for kids at intersections, on medians and on curbs. to spot children from greater distances. 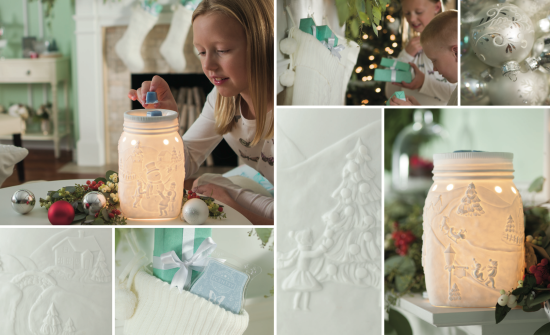 Bring winter fun into your home with our new Scentsy Snowman Mason Jar Warmer. With a vintage feel, there are 4 unique images on each side, lighting up a wintery wonderland. 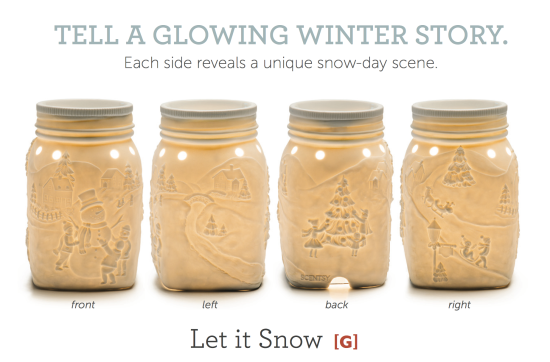 Take a closer look at our Scentsy “Let it Snow” Snowman Mason Jar warmer with a 360 view: (front) build a fun snowman, (left) a warm cottage up on a hill, (back) hanging special ornaments on an outdoor Christmas tree, (right) winter time sledding fun. Each month, Scentsy introduces a limited edition fragrance and warmer at a discounted price. 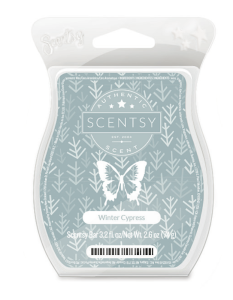 Our November 2015 fragrance is called Winter Cypress: A cool kiss of mint leaf, chilled raspberry and frosted lavender is an exhilarating ode to the first breath of winter. Check out our current Scentsy Bars here. Our Scentsy warmers use a low temperature to gently melt our soft wax bars, making our Scentsy candle refills the perfect combination to use with our warmers. We have over 80 fragrances, including all your Fall and Wintertime favorites like Very Snowy Spruce, Whiteout, Christmas Cottage, Peppermint Dreams, Silver Bells, and many more. 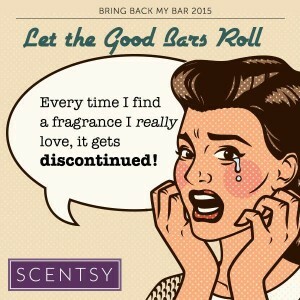 Scentsy Bring Back My Bar special voting going on now! It’s that time of year again! Bring Back My Bar is back, and this season we’re giving you the chance to vote for your favorite fragrances from Scentsy for just two weeks, from Oct 1-15. Travel back to a simpler time and make sure your bygone Scentsy Bar comes home again. The 20 fragrances with the most votes will be available to purchase for one month only beginning Jan. 1! VOTING HAS ENDED! Click here to shop your favorite Scentsy bars. With hundreds of Scentsy Bars to choose from, it will be tricky to only pick from 20 finalists. If you have a favorite, go vote! My favorites: Spiced Orange Harvest, Root Beer Float, Mulberry Bush, Sangria, Pumpkin Pie, Woodberry, Toasted Apple Butter, Grandma’s Kitchen, Sandalwood & Cranberries, Rustic Lodge, Red Delicious, Pomegranate Ice, Plumeria, Nutmeg & Orange Zest, and my customers really miss Patchouli. So there are some of my favorites. What about you? With hundreds of Scentsy bars to choose from, what will you vote for? 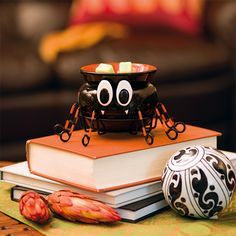 Scentsy Isty Bitsy Spider Halloween Warmer is the cutest little element warmer ever! Itsy Bitsy uses a warming plate instead of a light bulb to gently warm your wickless candle wax. He is a 3 piece warmer and comes with the legs, that hold the body, and the dish that sits on top of the warming plate. 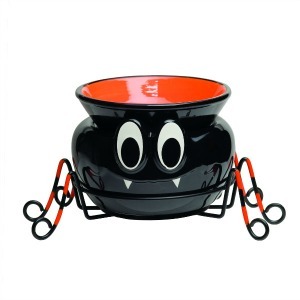 The Scentsy Itsy Bitsy Spider Halloween Warmer is 3.9″ tall and is currently unavailable. Click here to view our current Scentsy Warmers. If you want to create fun Halloween fragrance memories with Itsy Bitsy, don’t forget to add our soft, fragrant Scentsy Bar to your order. Scentsy wax is the highest grade fragrance wax, and is specially formulated to use with our Scentsy Warmers, melting at a low temperature. This is a safer way to enjoy fragrances in your home, without the dangers of a wicked flame candle. No wick, no flame, no soot, and no burn -perfect to keep your family safe during the holidays. 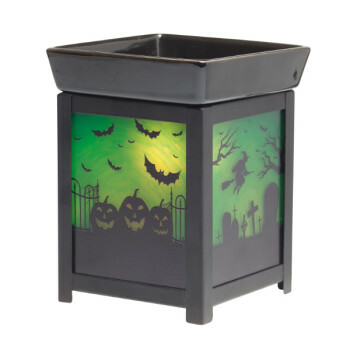 With the haunting green moonlight shadows, the Scentsy Pumpkin Graveyard Halloween Warmer gives off a chilling ambiance. 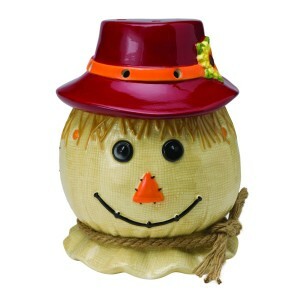 Scentsy Pumpkin Graveyard is one of the many seasonal Scentsy Warmers in our Harvest 2015 Collection. Scentsy warmers are a safe, wickless alternative to burning candles. Halloween is so fun, and it totally makes me happy when I reflect on the childhood memories that only fragrance can bring back. This year I’ll be warming yummy Scentsy Bar fragrances like baked apple pie, mandarin moon, and cider mill. Happy Halloween everyone! Have you seen the new Scentsy Halloween Haunted House? Haunted House sits above eerie tombstones, and will be the centerpiece of your Halloween décor. 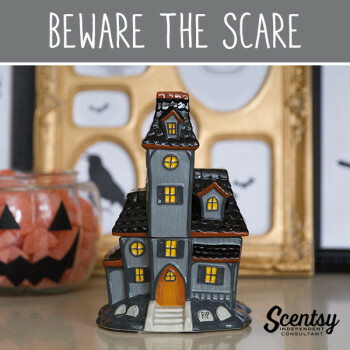 Our Scentsy Halloween Haunted House is one of the many warmers available from our Scentsy 2015 Harvest Collection line up. This is a wickless, electric candle warmer and a safe way to enjoy your fall Scentsy fragrances. With the crisp fragrances like pumpkin roll, autumn maple blaze, and honey pear cider, it’s so fun to create seasonal fragrance memories.